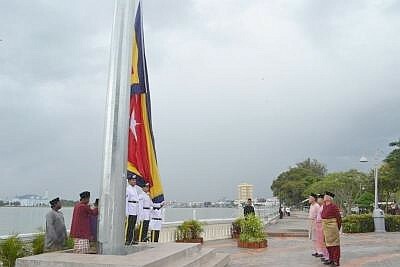 Respectful: Obet (second right) and Abdul Rahim (right) witnessing the raising of the state ceremonial flag at Dataran Tanjung Emas. State ruler Sultan Ibrahim Sultan Iskandar is set to revive Johor’s tradition of old royal titles and offices and bestow them on his children. The council of Royal Court secretary Datuk Abdul Rahim Ramli said the titles, such as Tengku Laksamana and others, would be announced here soon. He added that the Sultan wanted to revive the old tradition practiced by the royal family, including raising the state’s ceremonial flag before a royal occasion. “This was the reason we raised the ceremonial flag at the Dataran Tanjung Emas this morning before celebrating the Ruler’s 54th birthday on Nov 22. “The flag will be flying until after the five-day celebration, which also includes the declaration of Bandar Maharani as Bandar DiRaja of Johor,” he said at the district officer’s office here recently. Abdul Rahim, who accompanied state-secretary Datuk Obet Tawil added that 1920 was the last time the state’s ceremonial flag was raised. He said the celebration would begin with Tahlil and thanksgiving prayers in conjunction the Sultan’s birthday and the declaration of the town as the royal town at Masjid Sultan Ibrahim on Nov 21. He said the next day, the Tunku Mahkota of Johor Tunku Ismail Sultan Ibrahim would represent the Ruler at a thanksgiving prayer at the Diamond Jubilee Hall. The first barrage of a 21-gun salute would be fired from a canon when the Ruler’s name was mentioned in the prayer to be recited by the Johor Mufti. The police would man the artillery which would be placed away from the hall as the sound of the shots were very loud and could vibrate nearby buildings. He said the Mentri Besar, to be accompanied by representatives from the Chinese and Indian communities, would then deliver congratulatory speech and pledge of loyalty. On a separate matter, Obet said a tea party would be organised at the Muar stadium after the investiture at about 3pm and urged everyone, especially Muar residents, to attend. He said there would be some 60 food stalls serving traditional local dishes to the guests but urged those who wanted to join the tea party to be properly dressed. There would also be sport activities, car and boat procession, a high-performance car show of some 100 Ferraris and an international jet-ski tournament. During the boat procession in Sungai Muar on Nov 25, the town bridge would be closed to all traffics from 3pm to 5am the next morning. “There will also be a firework show and the people can watch it from the bridge and along both sides of the river. “We want the Ruler’s birthday celebration and the declaration of the town as the royal town of Johor to be grand and memorable,” he added.